To promote open communication among the parents, teachers, and administration. To provide parents and teachers with information to aid in all aspects of education, growth, and development. 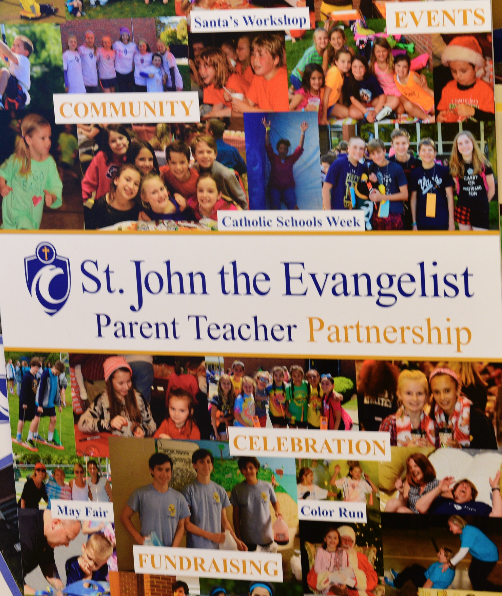 To promote good will and cooperation between and among parents, faculty, administration, school board, and the parish of St. John the Evangelist. To direct and coordinate parental support to St. John’s school through assistance activities, social functions, and fund raisers. To foster political action of parents as advocates regarding legislation that affects Catholic Schools as well as the lives of students and parents. If you have children attending St. John, you are a member. The PTP Executive Board meets monthly to plan events, and all meetings are open to any parent. If you have questions regarding the PTP please contact your PTP Executive Board Members at mailto:sjeptpboard@gmail.com. Sign Up At Your Grocery Store To Support Our School!